As crafters, we know how fun and satisfying it is to make and give a handmade present, especially when the recipient is a child. Remembering back to our own girlhoods, some of our most cherished gifts were handmade clothes for our beloved dollies. Whether they were made by moms, grandmas, aunts, or even purchased from craft bazaars, they were unique and special, just like the women who created them. YouCanMakeThis.com would like to invite you to share in the tradition of giving handcrafted doll clothes to girls at Christmastime. True, we are the beginning of a new year, but this is something we can create all year long in preparation for an event that begins each November — the Marine’s Toys for Tots Drive. Knowing that thousands of dolls are donated each year to this wonderful cause, we decided to make "tiny twirls" and tops so that children can dress their new dollies. 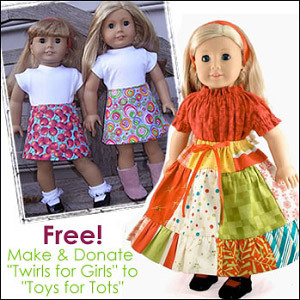 YouCanMakeThis.com is providing free, easy patterns so that you can make beautiful "twirl" skirts and tops to donate to your local Toys For Tots campaign. Our "Twirls for Girls" campaign just completed its second year and we are hoping for an even greater response as we launch into its third year. Whether you use 5" charm squares to create the patchwork twirl, or fabric scraps for a dolly wrap skirt, this is a project that will be a fun and meaningful one. Sewing groups, church groups, office staff, and friends are making these all over the world. Parents are also teaching their children how to sew and in the process, creating a beautiful memory for their child, too. In 1947, Diane Hendricks handcrafted a Raggedy Ann doll. She asked her husband Bill, a USMCR officer, to donate the doll to a charity that would give her to a child in need. Unable to find such an organization, Diane told Bill that he should start one. Toys for Tots was born out of a spirit of giving of oneself, and today brings the joy of Christmas to millions of children across the country. Any time we can use our time and talent to create something special for someone else, we feel good. We feel this way not only because we are doing something that we personally enjoy, but we are helping others in the process. It’s a wonderful thing. You can find more information and download your free patterns in the Make a Difference section at YouCanMakeThis.com.